Banff is a must for each tourist visiting the western part of Canada. Banff is located within the Canadian Rocky Mountains, which extend over 1450 kilometre from the Pacific Ocean to the prairie grassland. 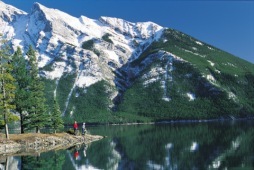 The Canadian Rocky Mountains with its many snow-capped peaks are unique on earth and attract many visitors from all over the world each year. The Rockies build a natural border between the provinces of Alberta and British Columbia. The town of Banff is part of the Banff National Park which is more than 6.600 square kilometre in size and is located just one hour drive west of Calgary. The Banff National Park is Canada's oldest park and wildlife reserve of its kind and was established in 1885. The Rocky Mountain Parks, six all together, are now protected as a World Heritage Site. 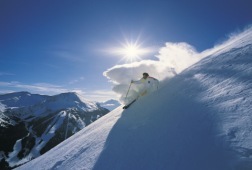 Banff, known as honeymoon retreat, offers all kind of recreational attractions year round. In winter time there are as much as three ski resorts, Mount Norquay, Louise, and Sunshine Village to please all friends of winter sports. In summer time this is an excellent spot for hiking, horseback riding, mountain biking, picnic or to enjoy the natural beauty and the stunning panoramic views. Another great attraction is the Columbia Icefield. The Columbia Icefield, which contains about 30 glaciers, is up to 350 metres thick. This remnant of the last Ice Age covers 325 square kilometre on the plateau between Mt.Columbia and Mt.Athabaska. Even if Banff National Park is an very attractive spot for tourists from all over the world, more than 95 per cent of the park remains complete wilderness. The Banff Park Museum has been declared a National Historic Site and contains a collection of animals, birds and plants found in Banff National Park. Sulphur Mountain Gondola runs to the summit and provides spectacular views of the surrounding mountains, Bow River and Banff townside from an altitude of 2.285 metres. You can walk up in about 75 minutes and are rewarded with a free lift down. Lake Minnewanka is the largest lake in the park and is located 11 kilometre east of Banff. This is a scenic recreational area surrounded by forests and mountains with hiking, swimming, sailing, boating and fishing available. The Bow river which flows from Banff through Calgary and south, is considered to be one of the five best trout fishing rivers in the world. For canoeing and rafting you can go on Two Jack Lake north-east of Banff, the Vermilion Lakes west of town, Echo Creek, 40 Mile Creek and Bow River. Equipment can be rented from numerous companies. About 57 kilometre north-west of Banff is Lake Louise, known as the jewel of the Rockies. It takes about 45 minutes on the footpath from the parking place. Lake Louise itself is a much-visited but stunning lake sitting in a small glacial valley, surrounded by treed snow-capped mountains.